I envy those of you who live in a place where you actually get to see the leaves change to the beautiful fall colors. We could take a drive up north to see the fall leaves, but I always seem to be busy when the time is right. So, anytime I'm in a place that I can collect fall leaves I gather and press them to display from year to year. One year a thoughtful friend took pity on me and sent me a little package of leaves....they are dwindling, but I still love and display them. I thought I would do a quick little project inspired by fall leaves that might get the creative juices flowing for some fall decorating. Create a mini display with an old jar and vintage buttons. I got a Vagabond Machine a few weeks ago and have been wanting to use the "tattered leaves" die. To start glue old music pages to some chipboard and run through the Vagabond. Use Distress Ink to ink the leaves in fall colors, I used Wild Honey, Fired Brick and Crushed Olive with Vintage Photo on the edges. Punch a hole in the top of each leaf and tie to the jar. Attach "Chitchat" stickers on leaves. Insert photo and you have a quick little vignette. 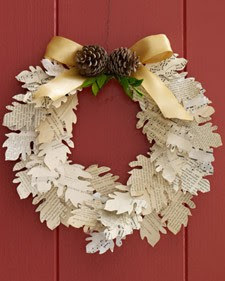 Here's another idea.....use the "Tattered Leaves" die to make a wreath. This one is from Martha Stewart using a template to cut out all the leaves by hand....get out your Vagabond Machine and "Tattered Leaves" die to save hours of cutting time! Great projects! I want to come play with your Vagabond! !....or get one of my own! Wow Deb, looks great! A few posts a go i wrote about leaves i found and how i decorate with it. Maybe some inspiration for you? Went to your blog...Thanks for the inspiration! Living in the desert we don't have that many deciduous trees....lots of evergreens and desert plants. Love your project and would love to get my hands on some old music sheets - haven't been able to find any yet... We have plenty of leaves here in NH and they were really beautiful this year! Now the effort is to get them raked up and ready for the town to pick them up - whew! Thanks for all you share on your blog - fun! Great projects, Deb! We have plenty of fall leaves in our yard here in Connecticut and you're more than welcome to them! My husband says "Please come and take them all"! When you use the Distress inks, do you finish your project with a clear coat spray? Since the Distress inks react with water, I'm reluctant to use them without a clear coat but I'd love to know what you do!! You could put a clear coat of spray or modge podge on the leaves, but I didn't think it would get that much wear and tear so left it without. Oh my goodness...I love the wreath!!! How did you do that? The wreath is from Martha Stewart, she made the base frame from wire. Here is the link for instructions. If I had know I could have sent you gorgeous leaves this year. They were prettier than I can even remember. Something about the dry and hot summer made the colors spectacular this year. Alas, now they are past their prime…no longer pretty. Love the jar with the decor. Deb, You sure did inspire me. I just ordered the Vagabond! It is supposed to be my Christmas present. I had been thinking about it for awhile and the leaves did it. Now I don't know which dies to start with since I have NONE! Guess the leaves will be first. P.S Maybe you will do more with dies so I get some ideas! Thanks. After raking leaves and cleaning them out of my flower gardens and gutters count yourself lucky you don't have to deal with the little buggers. Yours look a lot better and easier to handle.